The main dirt lot was surprisingly almost full when I arrived around 10am, though there was ample parking in an adjacent overflow lot. There are pit toilets and maps at the trailhead. There's also a water fountain, though don't count on it to taste very good. Spring is probably the best time to go here, as the hillsides are still green, there are flowers, and it isn't scorching hot yet. On the drive in I had seen raptors circling above, so I expected to see some on the hike, but it was not to be. 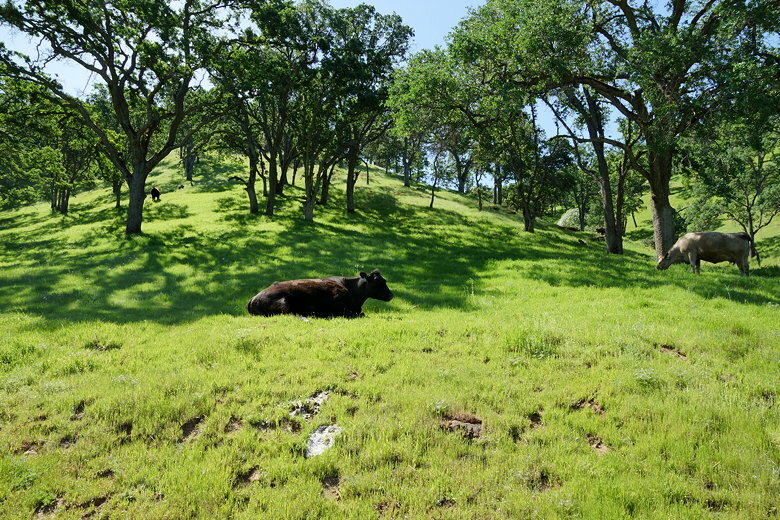 What you will see on this trail is cows. After crossing the bridge, we took the Miwok Trail to the right. 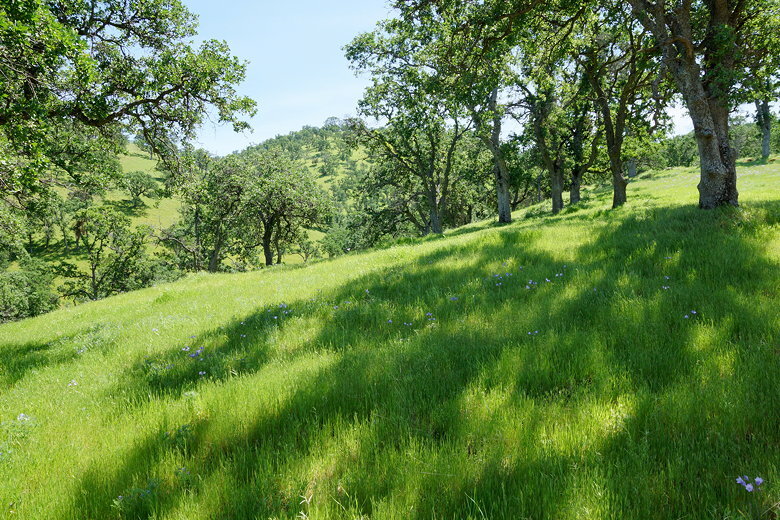 Our plan was to do a figure eight, combining a Miwok/Hardy Canyon Trail loop with a Miwok/Murphy Meadow loop. After a brief climb, we followed the trail as it roughly parallels Round Valley Creek (not much to see) and started to see the cows. They are prevalent throughout the park. There are certainly many more cows than people here. 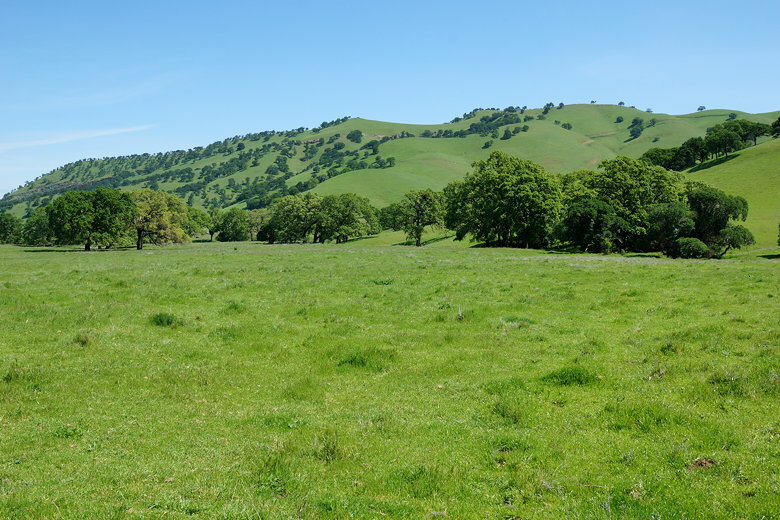 After about a mile and half on the Miwok trail, we reached an intersection and turned right to continue on the Murphy Meadow Trail. 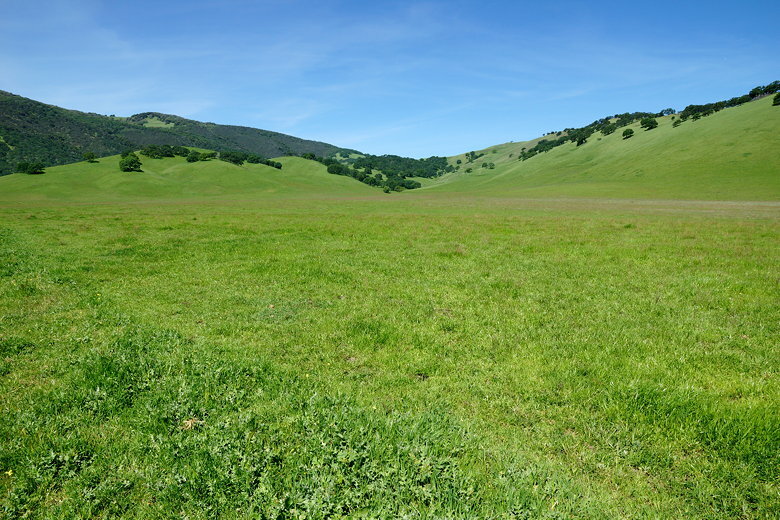 There are expansive views of the grasslands here. I was surprised not to see many wildflower displays. There were some, but nothing striking. We saw a large group of people near the edge of the park as we turned left to continue on the Murphy Meadow Trail. Apparently there's a group camp near here, though I don't think those people had stayed there. We followed the trail south to the edge of the park, where there's a sign stating that the trail from there into Los Vaqueros is closed currently. We backtracked briefly (we hadn't planned to take that trail anyway), then turned onto the Miwok Trail (a different section than the trail we'd been on before). A short time after that we reached a picnic table. This was on the trail map and I had hoped to have lunch here. The cows said no. 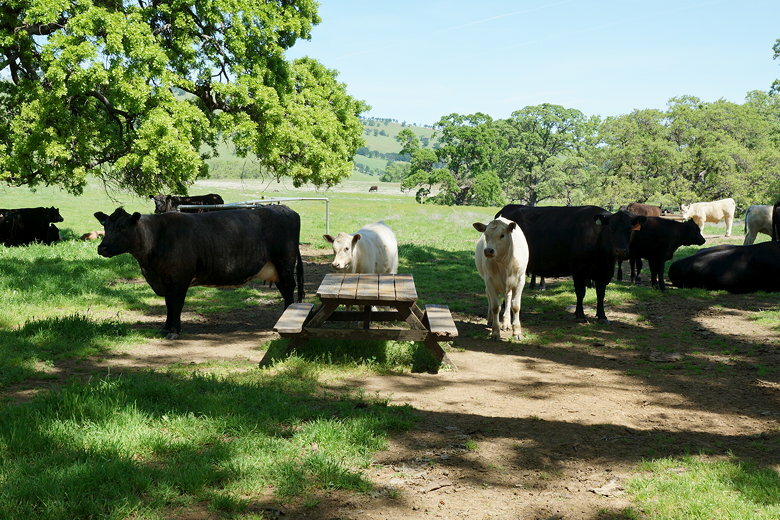 A large group of cows had staked out the area, and three cows stared at us from right next to the picnic table. We decided we'd keep going. We found a spot on the grass under the trees overlooking a small stream. There's poison oak in the area, so be careful. 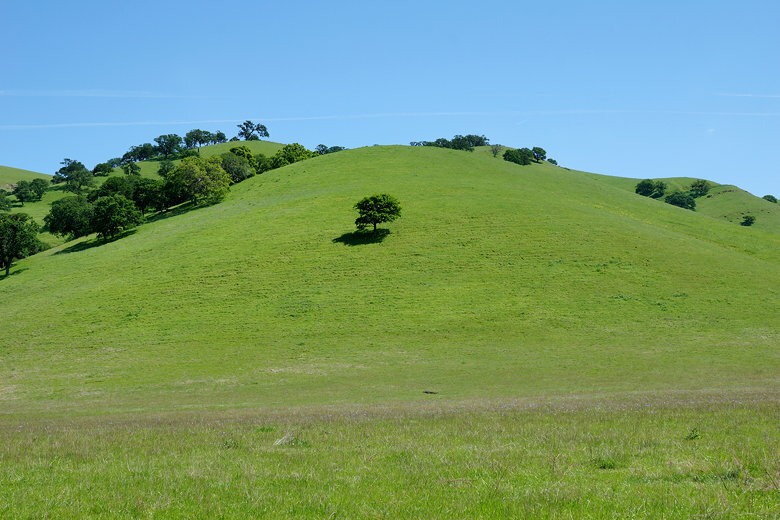 After lunch we continued along the Miwok Trail, with views of green hillsides to our right. At some point along the way we reached the Miwok/Murphy Meadow Trail and should have turned right to go back via the Hardy Canyon Trail. However, we missed it (it's a hard right and not at all obvious unless you're paying attention). So we ended up taking the Miwok Trail back the way we had originally hiked in. After reaching the bridge near the trailhead, we decided we would hike on the Hardy Canyon Trail anyway. We figured we'd just hike a ways in and then hike back out. 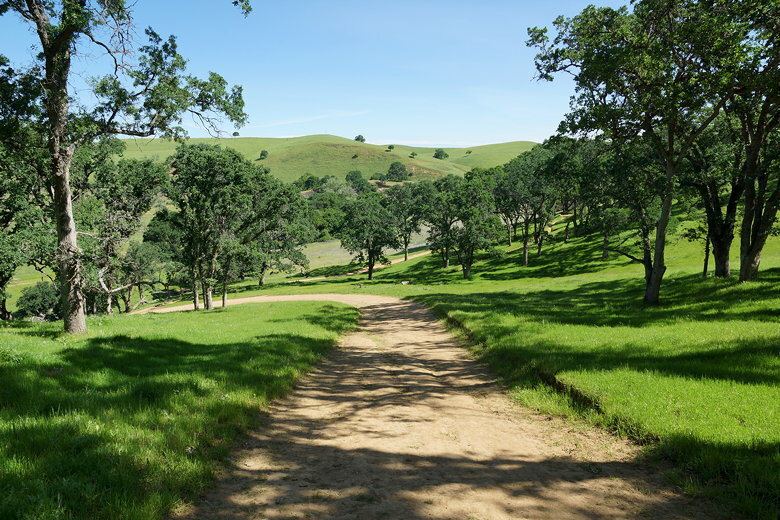 So we followed the trail past a group of picnickers by Marsh Creek, then out to views of Marsh Creek Road and the surrounding hills. 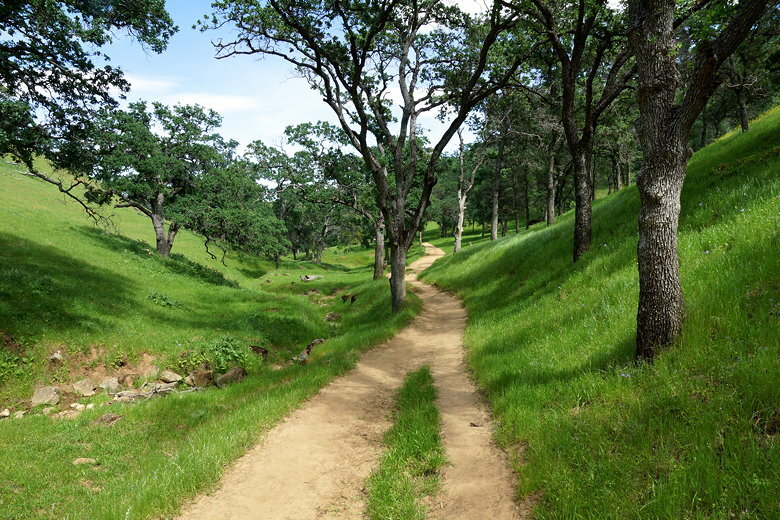 Shortly the trail starts heading uphill alongside High Creek in a narrow canyon. We hiked up the canyon for maybe 20 minutes or so before deciding to turn around and head back. On the way back, we took a side trail which we thought would meet up with the main trail, but it ended up depositing us near someone's horse stables. 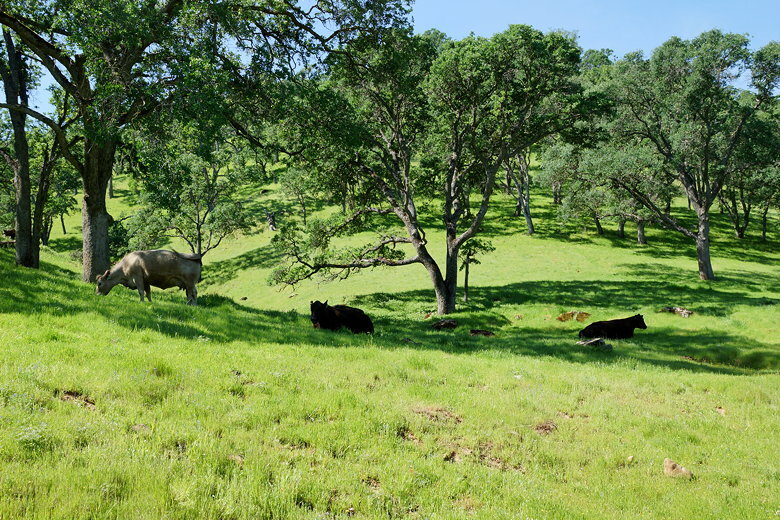 We traversed to our left through the cows to reach the main trail, then back to the trailhead. In summary, it's a peaceful hike through rolling green hillsides and fields, but nothing extraordinary. With our little detour, it turned into a 9 mile hike, though it would be about 7.5 miles if you take the intended route.